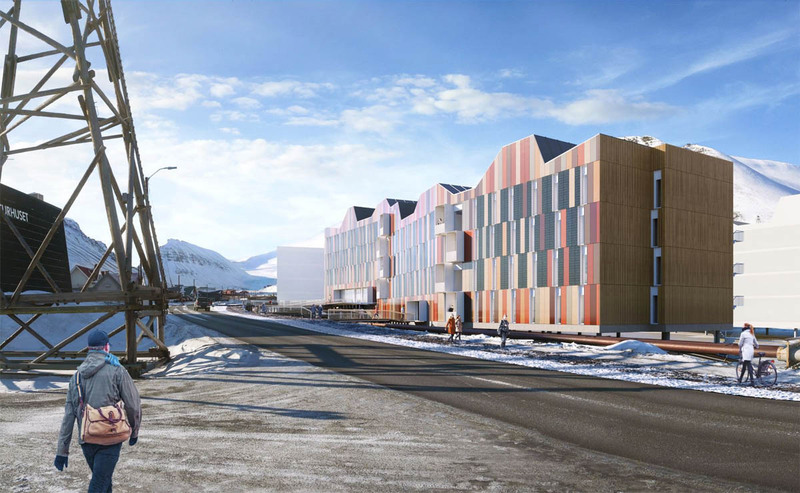 A total of 250 dorms and 30 hotel rooms are included in the latest proposed student housing project for The University Centre in Svalbard. The project, first proposed by the student board a year ago, is part of the university’s plan to relocate all housing from the longtime dorms in Nybyen to spaces near or adjacent to UNIS, due in large part because the Nybyen dorms are considered to be high-risk avalanche and landslide zones. Planning for the latest project began a year ago, with UNIS officials hoping to begin construction this winter and complete it by the beginning of 2020. Among the features in the most recent proposal are using solar cells to provide about one-third of the annual power consumption. The Longyearbyen Community Council’s Technical Committee is scheduled to discuss the newest proposal during a special meeting next week. Longyearbyen’s only supermarket is seeking to invest nearly nearly five million kroner for solar cells to help power the building, citing studies stating it will be financially beneficial in the long term. The store has applied for a 2.78-million kroner grant from the Svalbard Environmental Protection Fund to help cover the 4,78-million.kroner installation, which store officials are hoping will be completed before the end of next year. Recent instalation and tests of solar cells at Svalbard Airport and other facilities have shown the cells perform more efficiently than expected during daylight months because the cold weather maximizes efficiency.